Cincinnati prospect Tony Cingrani pitched two clean innings in a start for the Louisville Bats on Sunday, allowing no hits and no walks, striking out five. For Cingrani, those numbers were fairly typical. In his two previous starts for Louisville, the 23-year-old lefty recorded 21 Ks in 12.1 innings, yielding just three hits, two walks, and no runs. The atypical thing about Sunday's start was that Cingrani pitched only two frames before he was lifted. The Reds, apparently, are planning to call him up to take Johnny Cueto's spot in the big league rotation. Cueto is headed to the DL with a lat strain; Cingrani is almost certainly headed to Cincinnati. Fantasy owners, this is an actionable event. If you're in need of pitching assistance, you'll want to kick the tires on Cingrani. First of all, you have to like the way the Reds' schedule sets him up for short-term success. He'll likely face Miami and Chicago in his next two starts, teams that aren't exactly adept at reaching base or scoring runs. And secondly ... well, just take a look at Cingrani's minor league totals. C'mon. Those stats are obscene. After three appearances so far this season, Cingrani is leading the Triple-A International League in strikeouts (26), ERA (0.00) and WHIP (0.35). He was utterly dominant across two levels in 2012, going 10-4 with an ERA of 1.73, a WHIP of 1.03, and 172 Ks in 146.0 innings. 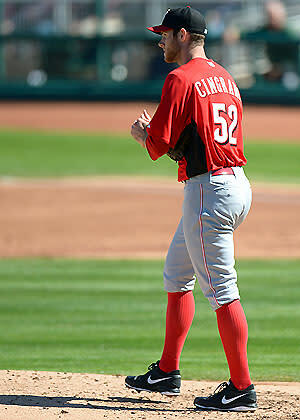 Cingrani made a late-season cameo appearance in Cincinnati last year (forcing his way into the Yahoo! player pool), striking out nine over 5.0 innings, giving up four hits and one run. But to this point in his pro career, Cingrani remains one of those tricky cases where the stats and the scouting reports are not congruent. He's piling up ace-level numbers, yet most prospect analysts seem to have him pegged as a good-not-great talent, a guy who needs to refine his secondary offerings. Everyone agrees that Cingrani's four-seamer is a quality pitch — low-to-mid-90s velocity, movement, impossible to pick up — but his breaking stuff generally gets meh reviews. Here's what we can say with absolute certainty: The hitters of the International League won't miss Cingrani a bit. They can't touch his stuff. And if he stays on schedule with the Reds, his upcoming starts will have a low degree of difficulty. In almost any format, this is an add worth making.